Destination signs (D1 series) provide guidance information in the form of a city name (destination) and the direction to the city. Destination signs are typically used in advance of intersections to help drivers decide which way to turn at the intersection. Distance Signs (D2 series) indicate the distance to the city shown on the sign. Destination and distance signs are especially valuable to motorists unfamiliar with a particular area. Because some motorists are inattentive, read maps poorly, or do not adequately plan their trips, additional destination and distance signs can help “pull” them through an area. People familiar with an area often do not readily see a problem with destination signing. This section presents suggestions for handling situations that often present problems for motorists unfamiliar with an area. Additional information on destination and distance signing can be found in the Texas Manual on Uniform Traffic Control Devices (TMUTCD) and the Sign Crew Field Book (SCFB). 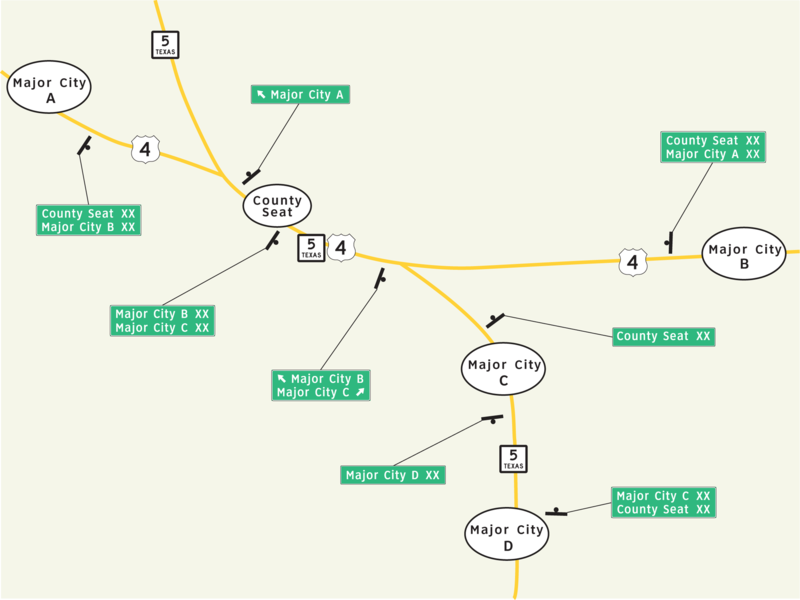 When traversing a combination of routes between major cities or destinations, motorists may find guide signing showing only route numbers confusing. Sometimes maps, with their limited detail, may also contribute to the disorientation. Distance signs are normally used to advise motorists of distances to destinations on a route. The destinations shown are selected based on the guidelines in the TMUTCD, Section 2D-36. Because many people navigate by destination names instead of route numbers, distance signing for other major destinations, in addition to that already in place, should be provided where applicable (subject to the maximum text permitted by the TMUTCD). Also, as previously discussed, trailblazing over a combination of routes for major destinations may be necessary if the routes together serve as a primary connecting link. Figure 7-4 shows an example. Because such distance signing and trailblazing expands the scope of normal distance signing, coordination with neighboring district offices is necessary. When additional destination and distance signs are required, the spacing between adjacent signs should be 300 feet minimum, with 400 feet desirable, on highways with 55 miles per hour or greater speed limits.